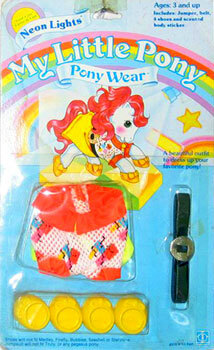 My Little Pony produced several fashion outfits for the ponies called Pony Wear over production years 2, 3, 4 & 5. 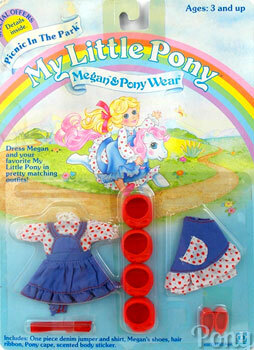 There was also doll outfits for Megan. 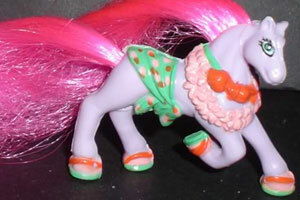 Images on this page thanks to Moondancer Paradise and many eBay sellers! 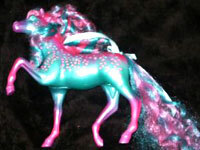 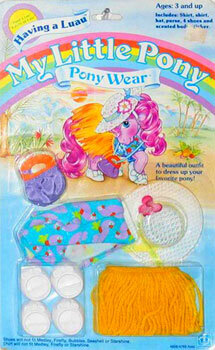 Find My Little Pony on eBay.com or eBay.co.uk ! 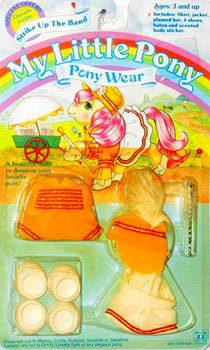 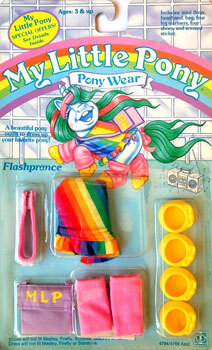 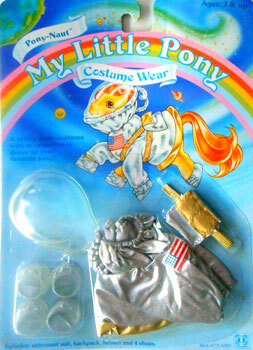 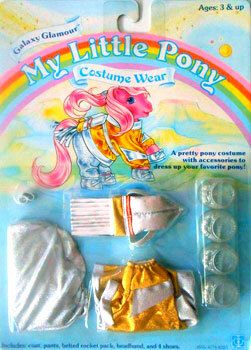 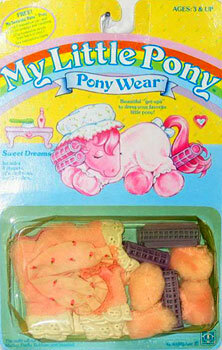 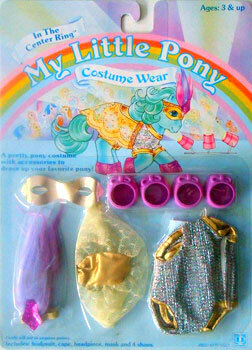 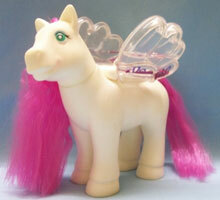 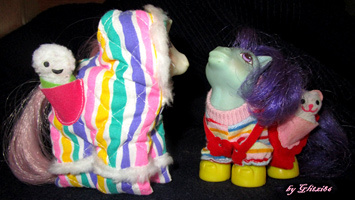 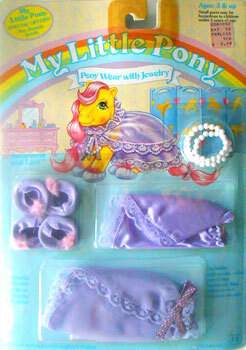 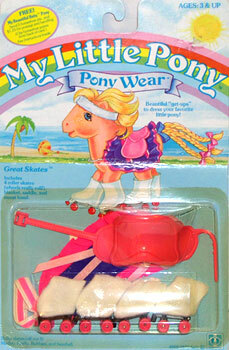 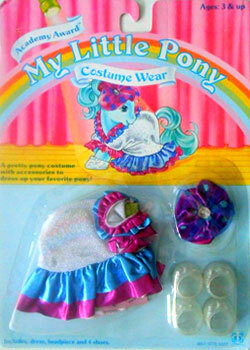 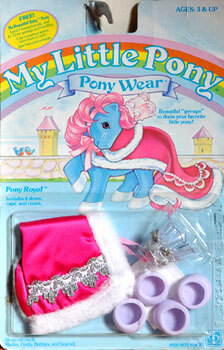 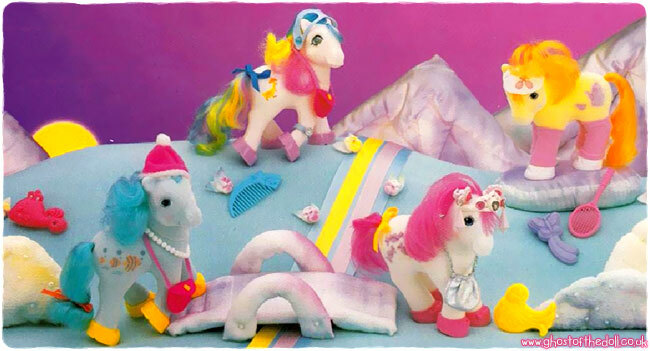 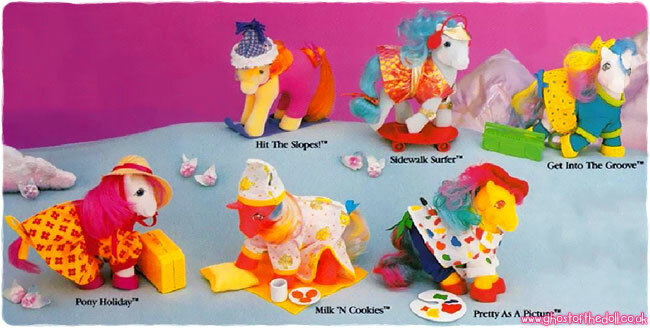 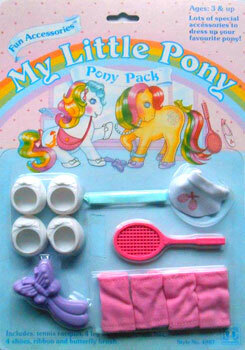 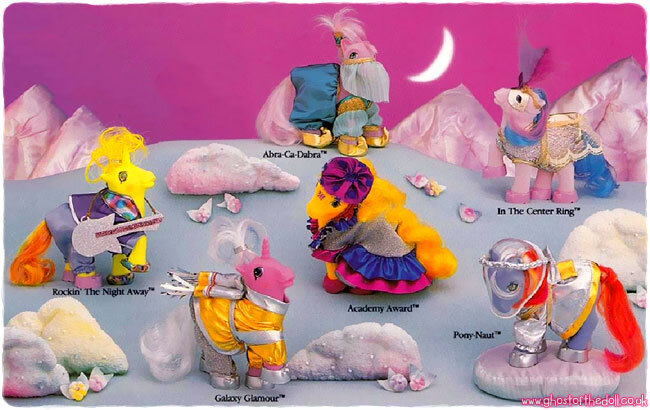 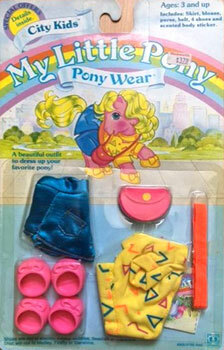 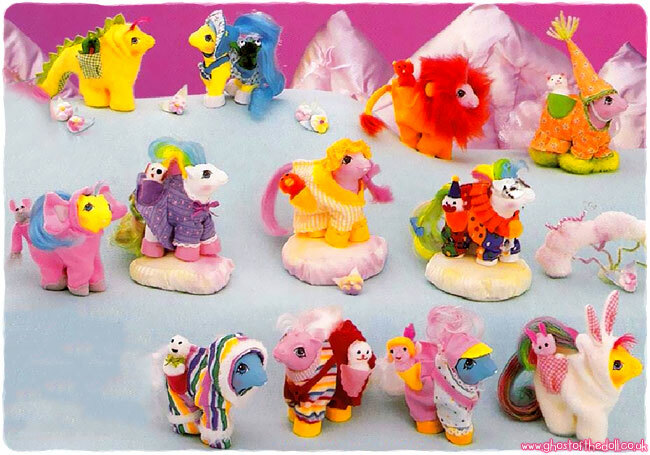 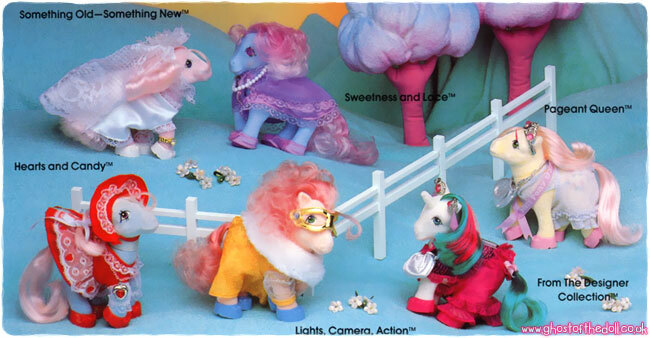 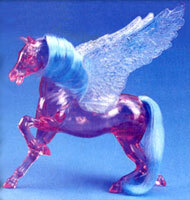 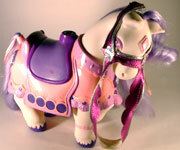 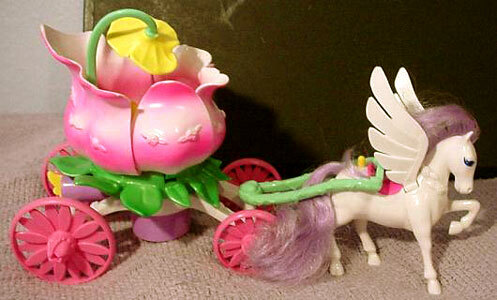 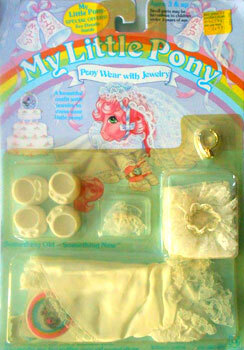 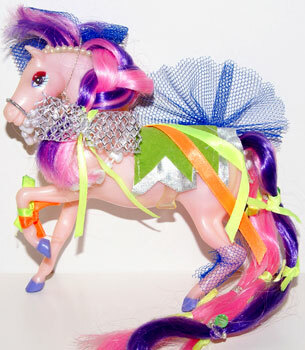 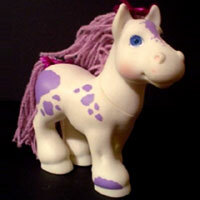 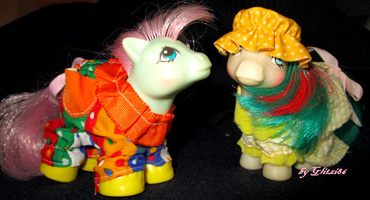 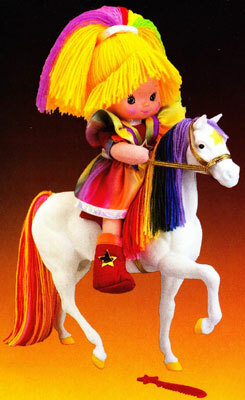 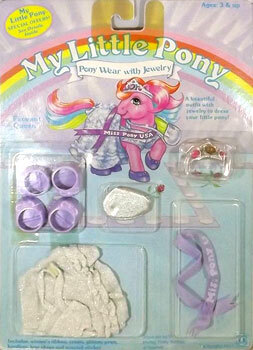 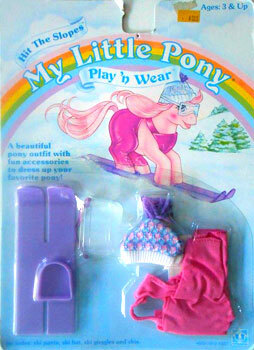 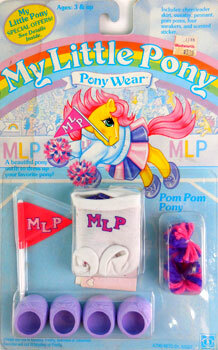 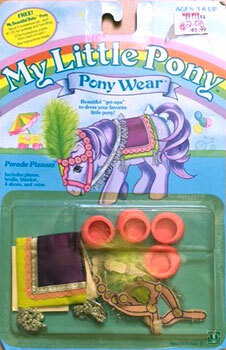 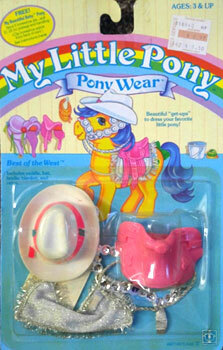 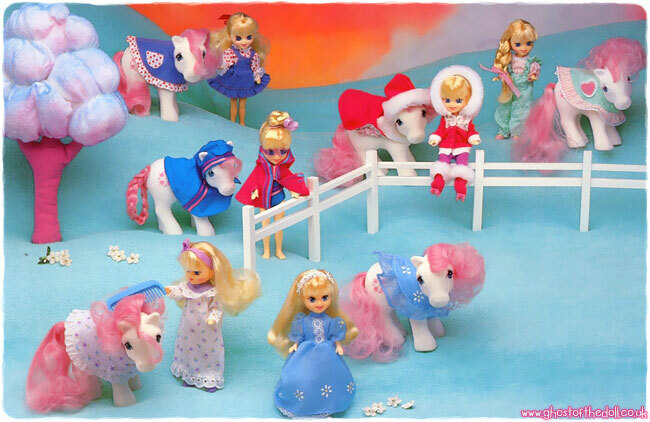 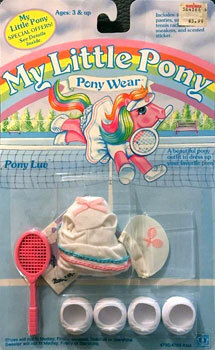 This was the first set of Pony Wear produced for My Little Ponies (USA, 1984), which included six sets. 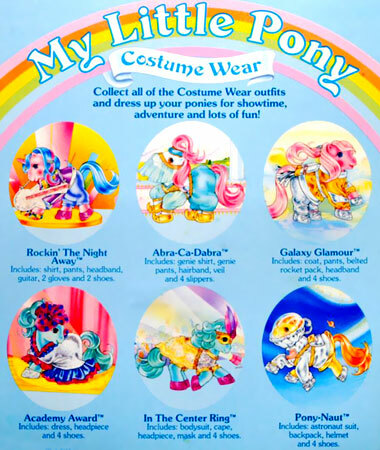 Only three of these six outfits were sold in the UK as part of "Collection 2", having already released three outfits the previous year. 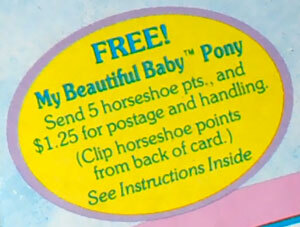 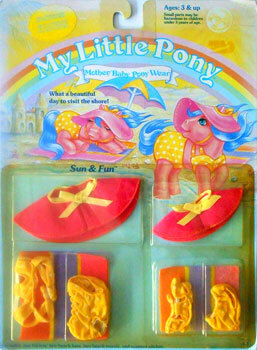 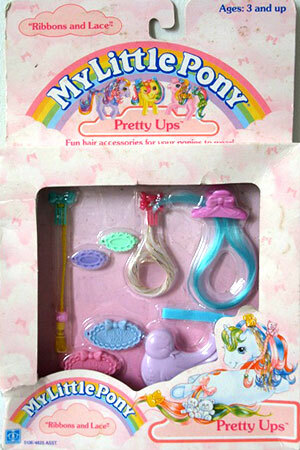 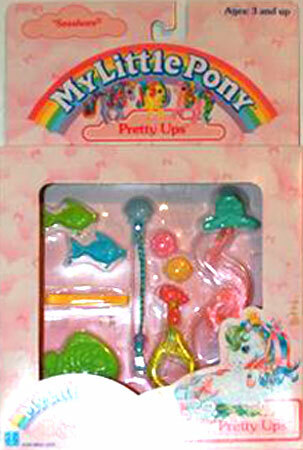 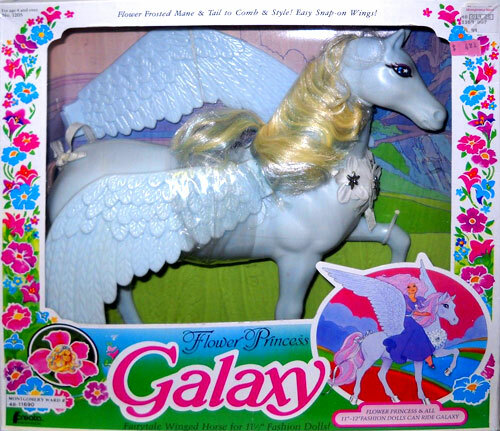 Packaging from 1984 included the My Beautiful Baby Pony offer. 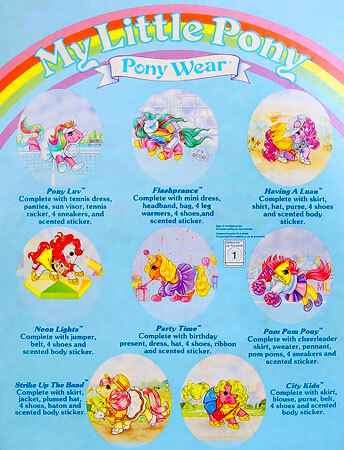 Four more outfits were added in 1985 (Year 3). 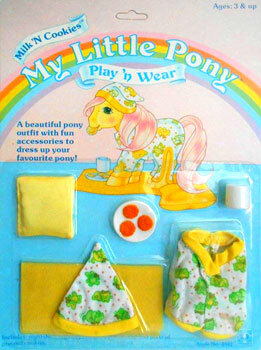 Three of these four outfits were sold in the UK as part of "Collection 3". 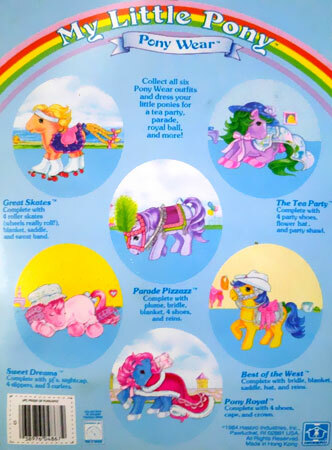 I haven't come across any US packaging for "Party Time" yet. 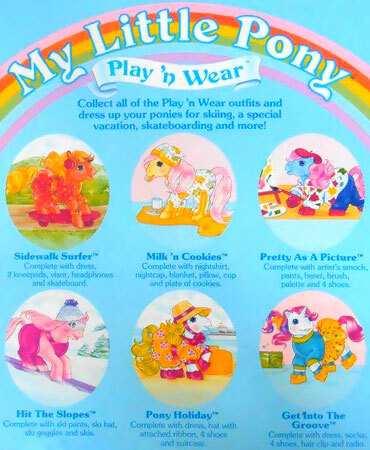 Four more outfits were added the following year (Year 4). 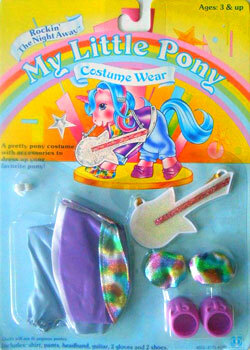 Each Pony Wear outfit came with a grape-scented sticker that pictured a pony wearing the outfit. 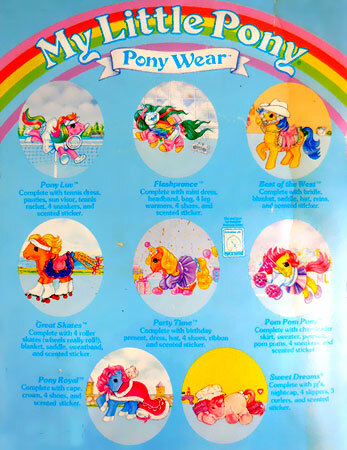 None of these outfits were sold in the UK. 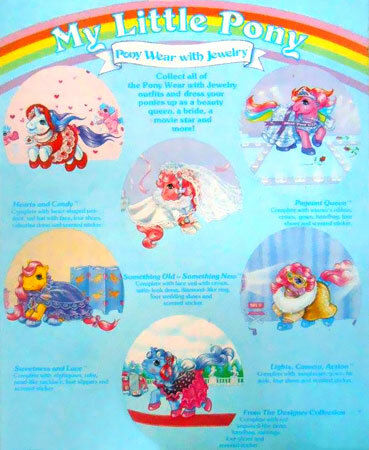 Early back packaging from 1985 included the four new outfits plus Best of the West, Great Skates, Pony Royal and Sweet Dreams from the previous year. 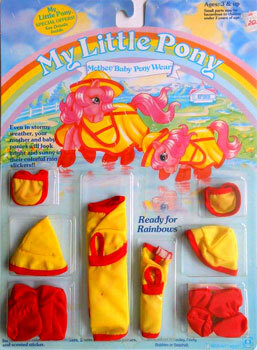 Later back packaging from 1985 included only the eight new outfits from that year. 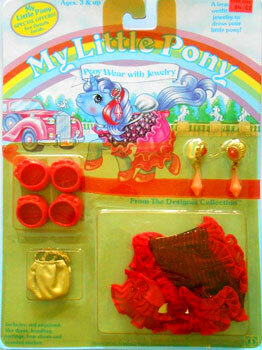 This set came with small pieces of jewellery UK as "Glamour & Giltter Collection" (Pageant Queen was not included and Wedding Bells was sold separately with Confetti pony). 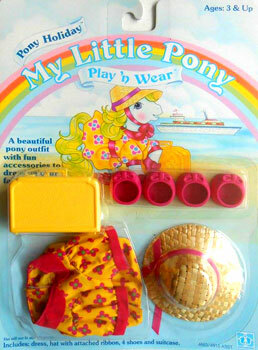 The adult outfits in this group were sold separately in UK as part of the Pony Wear Collection 4. 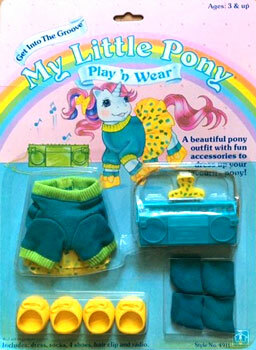 The only one not included in Pony Wear Collection 4 was the Rainy Day outfit, which was part of a different Pony Ware set. 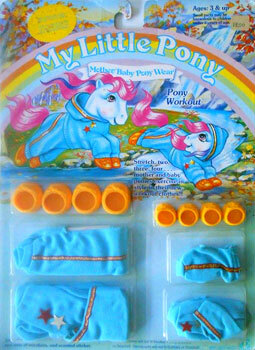 The baby wear was never sold in UK. 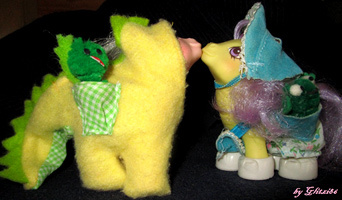 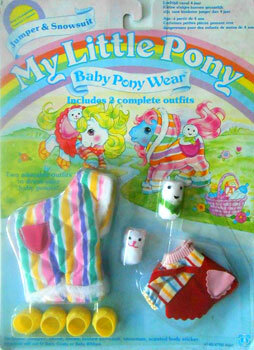 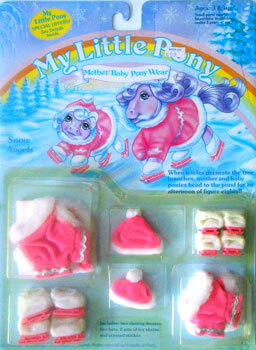 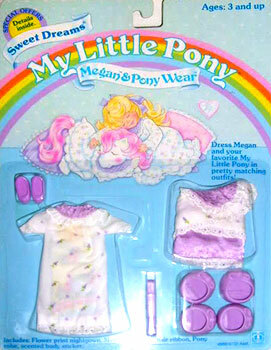 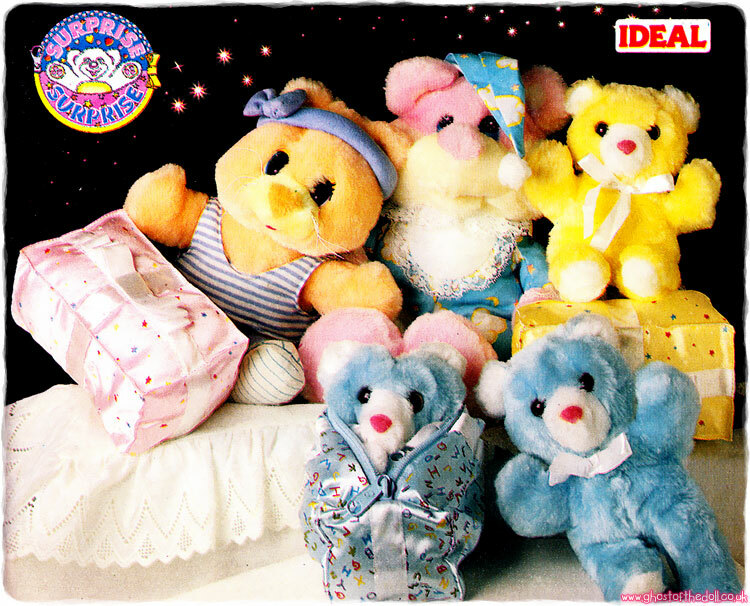 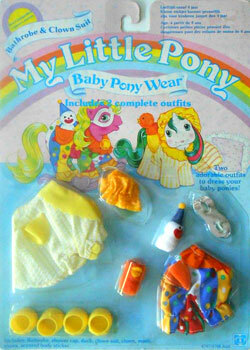 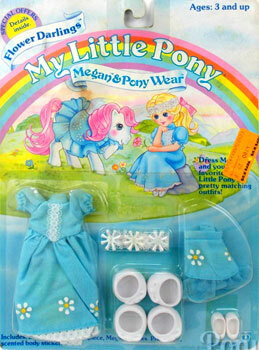 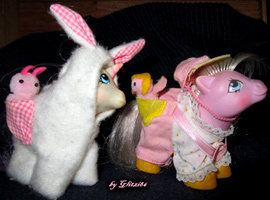 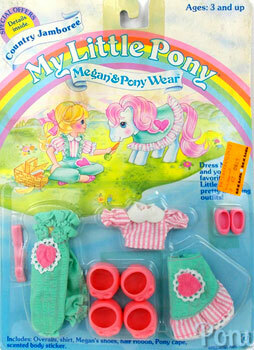 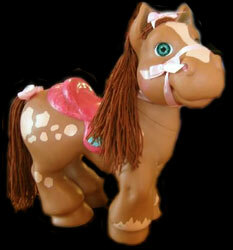 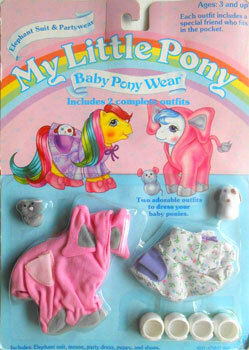 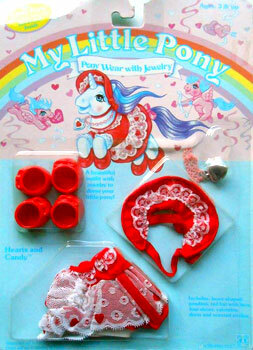 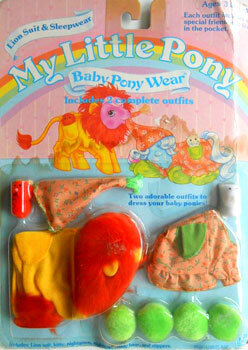 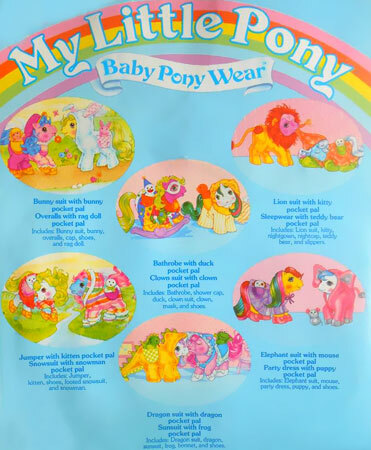 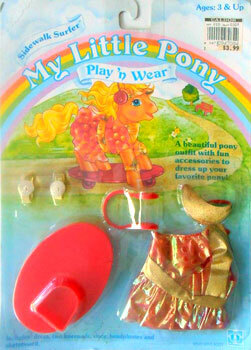 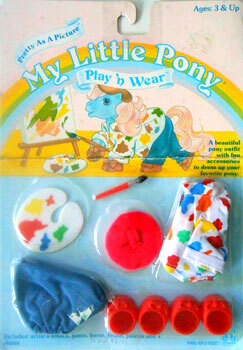 Baby Pony Wear with Pocket Pals was the first set of Pony Wear for baby ponies. 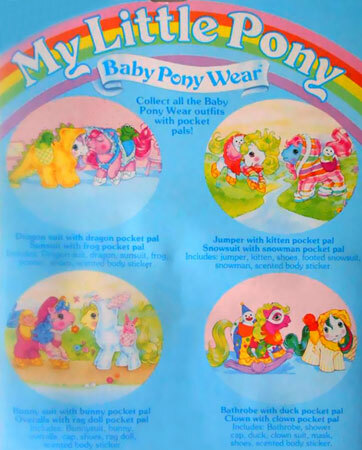 They were sold in pairs and each one came with a "Pocket Pal" doll, made up of two pom-poms, that fitted a pocket of a matching outfit. 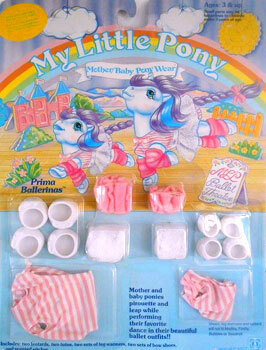 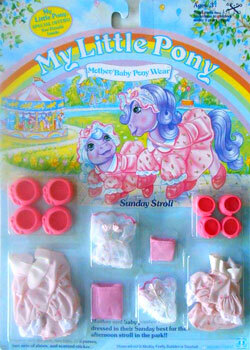 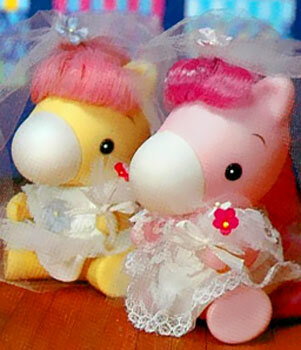 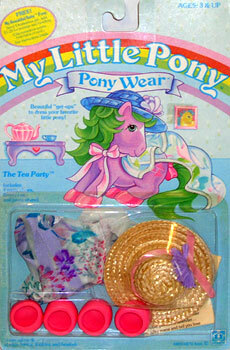 Each Baby Pony Wear outfit came with a grape-scented sticker that pictured two baby ponies wearing the outfits. 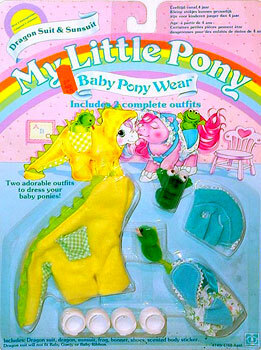 A second set was produced the following year. 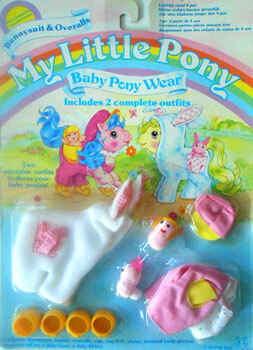 In the UK three of these outfits has slightly different names. 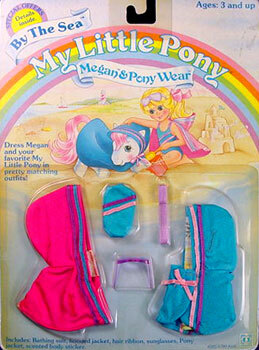 Each Megan and Pony Wear outfit came an outfit for Megan and a matching cape for Sundance. 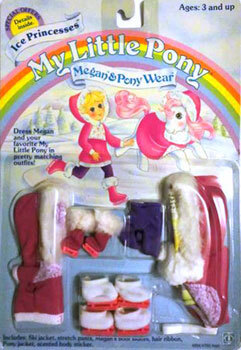 Each one came with a grape-scented sticker that pictured Megan and Sundance wearing the outfits. 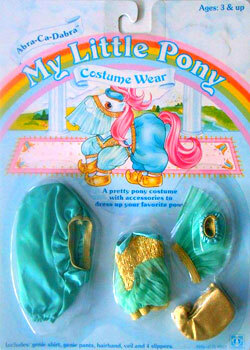 There were six Costume Wear sets. 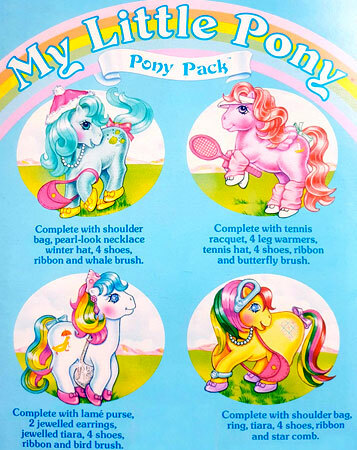 All six were sold in the UK. 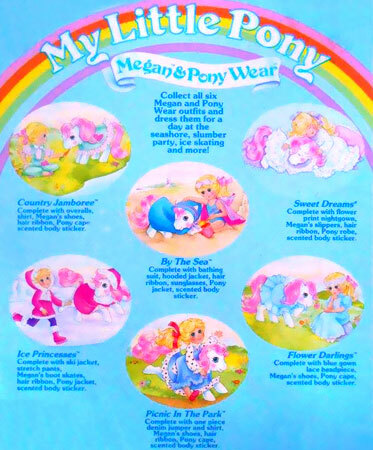 There were six Play 'n Wear sets. 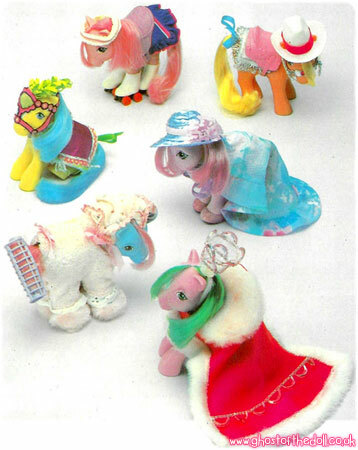 One had a name change in the UK, where all six were sold. 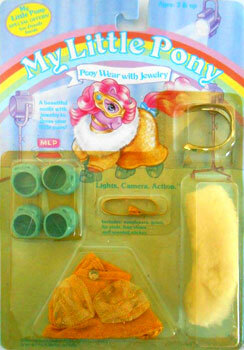 "Fashion accessories from head to toe!" 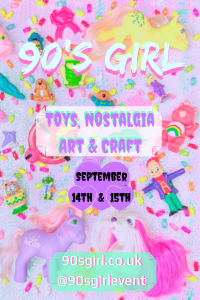 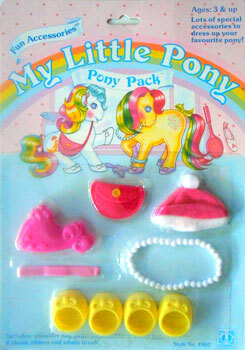 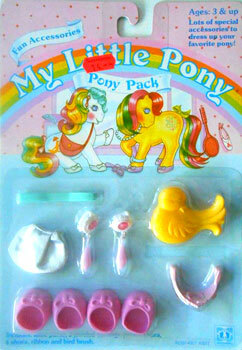 There were four sets of Pony Packs, each pack containing themed fashion accessories. 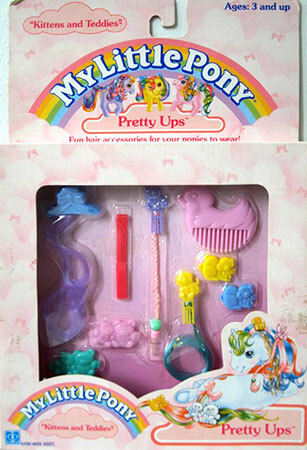 Each Pony Pack came with a brush or comb. 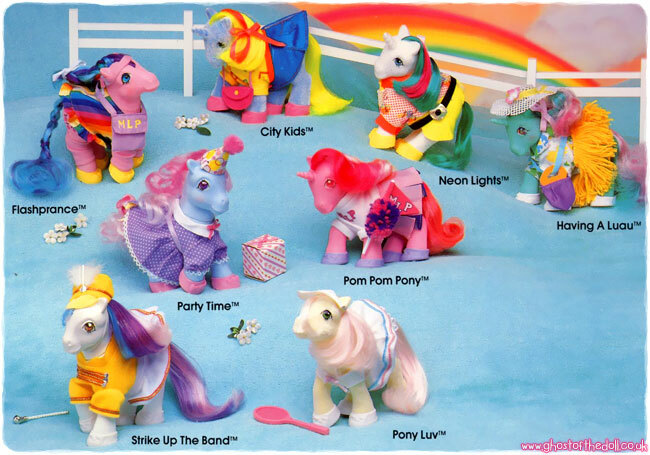 All six were sold in the UK, none had individual names (wherever they were sold). 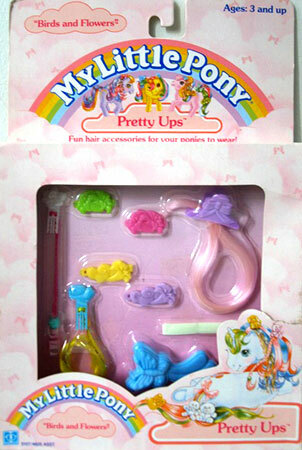 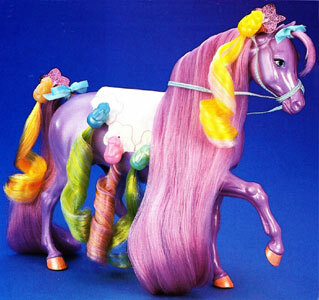 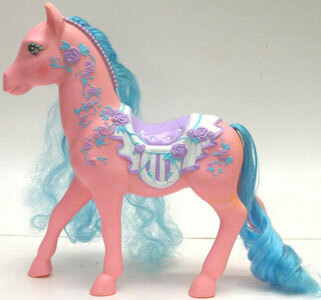 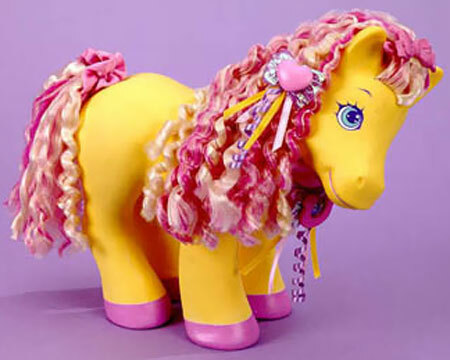 There were four sets of Pretty Ups, which were hair accessories for ponies. 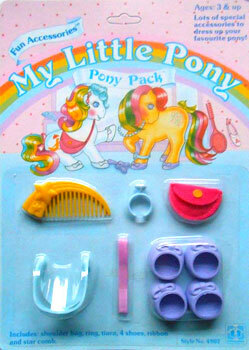 Each set included four hair-clips, three hair-grips with false hair, one ribbon and a brush or comb.